Developing your own business has become a dream come true for many in this generation. the ultimate aim of having your own business is to conquer the market space and make an identity for yourself in the market. There are many areas in which you can specialize and hence create a brand image in the market. On making a research study, you can find the common areas in which you can invest in and make profits. 1. Penetrate your existing market: keep your customers is the mantra here. Rather than putting efforts to find more customers, make good efforts to retain the people who are already buyers of your product. 2. Make product /service innovations: make new and better ideas for your product or service. Bringing out new uses to existing product and services in any niche can gather more customers who will prefer your products. One common example can be petroleum jelly, which has multiple uses in different industries. 3. Make referrals: you can find referrals from your customers who have been regular or users of your product already. This will help in getting new customers and also retaining your usual ones in a better manner. 4. Participate in trade shows: participate in trade shows which can help you to draw attention from more customers who are interested in the product that you deal in. therefore the trick is choosing the right trade shows for your product rather than going to every other trade show. 5. Extend your market reach: make ways to reach out to a wide market and especially to less privileged areas which others have failed to notice.think about opening new stores in new locations. Make ideas to enter into online modes of the business to conquer a wide audience. The best strategy for a wide market reach is advertising and media launch of your product. 6. Conquer your niche market: think about how you can be a start in the niche market. You need to be the big fish in the small pond. Find out the unmet needs of this market and focus on conquering them and ultimately becoming a star of the team. It differs according to what product you will specialize in. 7. Contain your costs: follow the cost-cutting initiative right from the start of your business. Only when you can achieve this effect you will be able to conquer the market easily in the long term. The pre and post-tax money will be effective for business growth. Cutting costs can be achieved by liquidating your loser products and also focusing on inventory turnover. Digital payments, real-time shopping in the virtual world are just not dreams but reality. Banking barriers have always been an uncomfortable feeling to entrepreneurs to wait endlessly for all the procedures to adhere and then get the currency exchange or any banking transactions to be done. As cryptocurrency becomes more into the mainstream, chances of you bumping into a real-time kiosk with coin ATM has to handle all those who are looking for quick money in the cryptocurrency. The rise in the demand for digital currency and internet-based coin money; itself proves that advancement in the field of payment processing over the different networks and payments itself. The eat way to convert the coins into cash and vice versa has made the entire banking industry to adopt the newer technologies within its ambit. Real world financial transactions are now becoming a thing of past and slowly moving into the world of virtual web. The sooner there is high traffic in virtual banking, there will be solutions to curb the hacking with the safety measures being stepped up to get a controlled approach. Do you know what miffed me when I began trading online? The world of online trading is not one where you can trust just about anybody. Statistics will prove that nine out of ten trading software are bogus, fake and scammers. But that was surprisingly not the reason I was bugged. My problem was something different! It is always so easy to create an email account specifically for the purpose of reviewing a product or a service and they abandon it forever. It may satisfy the urge to criticize a product or service unnecessarily but have these people who do it merely for the heck of it or because they get an economic consideration out of it even realize what the resultant repercussion is on the people who read such negative false reviews and take them at their face value, believing them to be true and then steering away from a completely legit and honest product? Because if they did, they wouldn’t be doing it in the first place and there wouldn’t be tens of hundreds of thousands of false negative reviews all over the internet. Let me tell you about my own experience! When I was looking to find a trading platform to trade in cryptocurrencies, I began scouring the internet for ideas. I came across hundreds of reviews telling me that Bitcoin Trader, legit and perfectly honest software was a hard-core scam. I couldn’t believe my eyes. At the same time, I was also scouring some of the freelancing microblogging sites to see if I could pick up a part-time writing job. What do you think I see? The website had a requirement for writing negative reviews for several of the trading platform that I could cross my fingers to tell you that they were perfectly legit. I was upset no doubt but on that day I realized that this is where the negative false reviews are manufactured. People write false reviews mostly negative for as little as five dollars; can you beat that?! I have been trading on Bitcoin Trader for two whole years and I could simply cast aside the false reviews but what about the people who cannot even tell the difference between an honest and a dishonest review. Most of the negative reviews on the internet are all false and I can tell you with the decided conviction that none of them; yes not even one of them would have actually downloaded the software or even got on it once and traded to be able to review it. They are all a sham! Right from its source to just now, this software is legit and I am a guarantee. You could get on to my Facebook profile and see for yourself the pictures that I post regularly of my winning trades. Can even a single negative reviewer produce evidence of their trading?! In early October of 2010, our first large-scale mixed use project was completed with the renovation of the Lincoln Building. The Lincoln Building is a complete renovation of the 100 year old, four-story Lincoln Supply Warehouse into 30,000 square feet of mixed-used commercial and residential space completed by Brininstool + Lynch architects with Rich and Gardner Builders. Floors one and two contain first-class office space and floors three and four have been transformed into a 10 unit “live/work space” for artists and other tenants. The units range in size from 1,151 to 1,270 square feet and rent for about $1 a square foot per month, including utilities. In addition to this, two floors are clubbed to form a penthouse that can be rented or sold as per the demand. The interior of this housing structure is so beautifully parted that it contains spacious living, dining, bedrooms as well as bathrooms. Additionally, all the bedrooms open up to a green balcony where you can do vegetation of your interest. Moreover, the interior decoration of each and every room is really breath-taking which is blended up in an eco-friendly and ornamental manner. The house also has trendy furniture in each room which is designed in such a way that it fits into both the modern and the traditional concept. Even the kitchen has an attached storeroom facility where all the food or other utility provisions can be kept safely and away from the reach of children. If you are interested in buying this property, contact soon. Credit card or crypto code currency payment is applicable. The Syracuse Center of Excellence provided much of the funding and expertise in the selection of the building systems, which include a geothermal field, solar panels, hot water on-demand, an innovative living wall screen over part of the building, rain water recycling capacity, and others. The Lincoln Building will apply for LEED certification by the USGBC and it will join the countless other great and green projects taking place all over the neighborhood. A Youth Leadership Team Kicks Off! The NWSI – near west side initiative is a program that been framed for the well being of the people who live in the near west side area. This includes economic developmental initiatives, jobs, health, housing and academic enrichment for the people who live here. Along with these, art and culture also play a pivotal role is NWSI’s development. Social enterprise: there is an enterprise by name SALT Works which engages people in furniture designing and woodworking. The people who are enrolled in this program are thereafter directly inducted into a full-time job with living This has been proved to be really helpful in eliminating the issue of unemployment in these areas. Cultural vitality: there are regular cultural programs like game nights in the neighborhood, light decorations competitions, clean up days and appreciation nights for teachers, Thanksgiving dinners, multicultural parties, and youth basketball tournaments. This also combined with cultural centers for fostering the improvement of the Latino Art forms and cultural necessities. And there are also school collaborations related to improving poetry skills and fostering these skills in young people. Health initiatives: providing health care to these areas has been another challenging task in giving integrated and preventive health care. The grocery stores also have a counter which enlists the health food options and community events. Also, the health center patients can get subsidies to buy healthy food options from such grocery stores. The below directory will provide with all necessary links that can help you to completely understand the important activities for community wealth building. This has been a global lesson for the entire world to understand the importance of developing even the less fortunate areas to ensure global economic development. Such unity in thoughts will lead to a better future and happy faces all around. when community building has been prioritized, then the nation growth is ensured. This has been found out clearly by the people in these areas so that it can be developed and also focused well. There is also a special mention of art and culture which is equally important. The advantages of issuing microloan can aid in the growth of any business in an easier manner. See this here to find out more about the various institutions that offer such microfinance. There are many good intentions that support this cause and summed up here are some of these. More than $70 million leveraged in new capital investment. Two major warehouse conversions, the CaseSupply and the Lincoln Supply buildings, totaling more than 250,000 square feet of space. Sixty homes built or rehabilitated by Home HeadQuarters. About $3.3 million spent on green infrastructure in the neighborhood. The Near West Side has not seen this much new investment for decades. Besides all that, the neighborhood continues to benefit from a host of agencies, not-for-profit organizations and businesses working hand in hand to make the neighborhood a better place to live and work. Even the whole area was once deserted. But now, each resident has come up with the great idea of planting a tree or more on their own financial expense in front of their housing premises. This made the area look more attractive than before and feels like more welcoming for outsiders. You can view publisher site for seeing the photos of the same. Even so, it has been challenging at times to get the word out about all the activity to the residents of the Near West Side. The Near Westside Initiative turned to Nojaim Bros. Supermarket, an independently owned grocery store that has been a neighborhood asset, employer and anchor for 90 years. It is one of the places a majority of neighborhood residents visit often — whether to do regular grocery shopping, or just to pop in for a gallon of milk. With such a consistent flow of residents, the NWSI partnered with store owner Paul Nojaim to create the “Neighborhood Navigator.” The NWSI then proposed the idea to the Annie E. Casey Foundation, a national foundation who has funded NWSI projects for the previous two years. The Annie E. Casey Foundation agreed to fund the pilot year recognizing an opportunity to use an established neighborhood business as a neighborhood communication tool. The Neighborhood Navigator is a physical presence inside the grocery store. Residents can come and ask questions and learn about services and opportunities. Questions range from learning about becoming a first-time homebuyer, to getting children enrolled in Say Yes to Education after-school programming, to getting general assistance with Electronic Benefits Transfer. Nojaim had already created a digital display system in his store to promote local organizations and community events so it seemed like a logical next step to create this physical place. As people enter the store, it’s hard to miss the Neighborhood Navigator with its large images highlighting neighborhood people and events. Martina Mason, a longtime neighborhood resident, greets residents at the counter. Mason is the main “navigator” trained to answer questions and share information about partnering groups. Mason staffs the space for 25 hours a week. The hours are posted, and typically they correspond to the busiest hours in the store, including weekends. 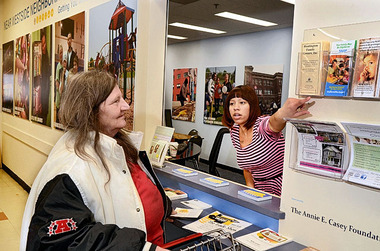 In addition to Mason, the Neighborhood Navigator offers an opportunity to partnering organizations to host day-long events and promotional activities in the space to further get the word out about the different services they offer. So far the program has partnered with a dozen groups including: the NWSI, Onondaga County Health Department, Huntington Family Centers, the Spanish Action League, Home HeadQuarters, ProLiteracy, Cornell Cooperative Extension, Signature Syracuse, 601 Tully, the Lerner Center, Say Yes to Education and St. Joseph’s Westside Health Center. More partners will join after the New Year, as the Neighborhood Navigator program irons out any initial kinks in its opening month. For information about the Neighborhood Navigator, call Martina Mason at 315-472-0777, send email to neighborhoodnav1@aol.com, or visit inside the Nojaim Bros. Supermarket, 321 Gifford St.
Maarten Jacobs, director of the Near Westside Initiative, writes occasional reports about Syracuse’s West Side for the City Neighbors section. He lives in Syracuse with his wife, Andrea, and their two children, Sam and Ollie. He can be reached at mjacob01@syr.edu. Originally published in the Post Standard on November 15, 2012. In an old, once-abandoned factory at Geddes and West Fayette streets in Syracuse, a model for American manufacturing is emerging. A young company, Borough Furnace, is melting and molding iron by using recycled materials, a green and sustainable process, and creative financing techniques. John Truex, 30, is the founder of Borough Furnace. He spent several years studying sculpture at the University of Tennessee where he became interested in large-scale iron casting. He moved to New York City to work as a designer for high-end furniture maker Dakota Jackson. He said he became frustrated by the disconnect between design and the manufacturing process. After a few years, he left to focus on manufacturing his own designs and returned to his love for iron casting. Working with his cousin, Jason Connelly, Truex started to prototype cast iron skillets and founded Borough Furnace. “We decided to pitch our prototypes to the A+ Young Designers Platform at the New York City International Gift Fair,” says Truex. With a stroke of luck, they were selected to display their work at the biggest gift fair in America. Truex said large buyers, including the Cooper-Hewitt Design Store in New York, began asking for orders. Truex searched for manufacturers to make the skillets. Instead, Truex decided he would learn to manufacture them himself. Over the course of six months, Truex and his cousin designed and created their own furnace, capable of casting iron at 2,700 degrees Fahrenheit. Unlike the traditional coke-fired cupola furnace, Truex designed a “green” version. “The furnace uses waste vegetable oil from local restaurants and businesses,” Truex said. “It makes for a lot less nasty smoke and is much cheaper as well.”But now, we are on the track of producing biogas from the vegetable and other bio-degradable waste collected from these same places so that the energy use becomes more effective in nature and also, the remains after gas formation can be converted to good organic manure and can be sold out in the online market for a good money that adds to our income. You can click for more info here. Realizing his “green” and efficient furnace made a breakthrough, Truex set out to find financing to start manufacturing. Like thousands of entrepreneurs, Truex headed to Kickstarter, an online platform that raises money for new businesses through “crowd sourcing.” Over the course of 30 days, Truex raised $32,000, exceeding his goal of $25,000. Using his new capital, he fine-tuned his furnace, and created molds for a frying skillet, a braising skillet, and a bottle opener. After months of tweaking his molds and doing test pours, Borough Furnace was ready to find a permanent home to start production. By then, the summer of 2010, Truex was moving to Syracuse to teach industrial design at Syracuse University. Truex found the Gear Factory, a large warehouse on the Near West Side of Syracuse that was once home to several manufacturers making bikes, typewriters and other products. The century-old factory is now owned by Rick Destito, who is turning it into space for musicians, artists and craftsmen. In need of additional startup capital, Truex turned to the Near Westside Initiative’s microloan program. The 2-year-old microloan program, created with a grant from the CNY Community Foundation and managed by the Cooperative Federal Credit Union, assists entrepreneurs and small business owners located in the Near West Side. With a microloan of $20,000, Truex was able to lease a space in the Gear Factory and hire his first employee. He bought a ton of recycled iron from a local junk yard. He takes 30 pounds at a time, heats it to 2,700 degree Fahrenheit, and pours the liquid iron into his molds. Borough Furnace is still in its early stages but steadily moving forward in sustainable, small-scale manufacturing. In a time when Americans want to keep jobs from going overseas and are looking for a new way to once again make things locally, businesses like Borough Furnace may offer part of the answer. To learn more about Borough Furnace, go to boroughfurnace.com or email John Truex at info@boroughfurnace.com. Nearly 350 parents have signed up for free classes, offered by the Syracuse City School District, in subjects such as teaching your child Spanish, how to deal with school bullies, and Zumba. The program, called Parent University, opened in October with a kick-off event at Onondaga Community College. Hundreds of parents turned out to snack on a free breakfast buffet and listen to Superintendent of Schools Sharon Contreras explain her vision of Parent University. “We stand here today delivering on our promise to inform, involve, and empower our parents,” she said. Parent University, she added, helped accomplish two main goals: holding both children and adults accountable for students’ success, and improving communication at school, at home, and between the two facilities. She also told parents the first time she heard about Parent University, while interning in the Philadelphia public school system. When Contreras came to Syracuse, she brought the idea to Say Yes to Education, a non-profit organization that collaborates with city schools to improve education district wide, and its executive director of parent family engagement, Monique Wright-Williams. “I introduced the concept to Monique Wright-Williams and Say Yes to Education, and they ran with it,” she said. Betty Stevens, who has a son at Fowler High School, joined a large number of parents who signed up for a class about identifying and dealing with bullying. Stevens recalled an incident in 2008 when her son was bullied. “I’ve been concerned for him,” Stevens said. Further, she added, the school sports committee has also announced a Zumba session, especially for the high school kids. This makes them more active as they move their body according to the tune and this seems to an effective exercise for these growing ones.Visit the school website for knowing more about the fee charged for this activity. Wright-Williams said she was interested in the program from the beginning. After Contreras approached with the idea, she went out and attended community meetings and other public events to connect with parents and gauge what type of workshops they would be interested in. After the initial surveys, she met with parents and other community members every three weeks for a four-month period in order to outline the details of the program. “I tried to make it as much of a community effort as I possibly could,” she said. Wright-Williams added that she has enjoyed the large turnout and positive feedback. “People are pleased with how things are going,” she said.